Director/Additional Screenplay Material – Noel Clarke, Screenplay – Simon Lewis, Producers – Noel Clarke, James Harris & Mark Lane, Photography – David Katznelson, Music – Tom Linden, Visual Effects Supervisor – Ben Shepherd, Special Effects Supervisor – David Payne, Production Design – Paul Burns. Production Company – Unstoppable Entertainment/The Tea Shop & Film Company. Ryan wakes up with no memory of who he is and in a van with a young boy who is being held prisoner. He flees with the boy as they are pursued by armed men – only for Ryan to realise that he led the men and was responsible for the boy’s abduction. He then blacks out and awakens some days later. Through successive of these blackouts and reawakenings a few days later, he gradually becomes aware that he suffered brain damage following a car accident. His mind is being taken over by people associated with the Hibiscus Trauma Centre via a control device planted in his neck. His body has been used in a scheme involving the abduction of a Russian virologist whose son is the boy being held hostage. With only a window of nine minutes consciousness when control goes down every few days, Ryan fights through these gaps to regain control of his body, stop the scheme and save the boy. The Anomaly is a directorial outing from Noel Clarke, a British actor better known to genre followers for the recurring role as Billie Piper’s boyfriend Mickey in Doctor Who (2005– ) and various film roles, including the zombie film Doghouse (2009) and Star Trek: Into Darkness (2013). Clarke has written several films and directed three others, including the non-genre Adulthood (2008), 4.3.2.1. (2010) and Brotherhood (2016). He previously ventured into genre material as writer/star/producer of Storage 24 (2012) about an alien nasty loose in a storage facility and with the subsequent abduction and imprisonment thriller 10×10 (2018). I was not hugely impressed with Storage 24 and so went into The Anomaly with low expectations. I have to say I was pleasantly surprised. Noel Clarke operates from a strong and intelligent script by British novelist Simon Lewis. This comes a disorienting fascination that is the mark of all good science-fiction – there is a great opening within the first few minutes as Noel Clarke and the boy exit the van whereupon the camera suddenly pulls back to show the London skyline where the familiar landmarks are dwarfed by an array of new futuristic buildings, before Clarke discovers through his memory gaps that he is the very man responsible for abducting the boy. Indeed, the whole film exists as a series of constant disorienting twists – in which Noel Clarke’s protagonist is not only having to discover who he is, why he keeps appearing to jump through time and ending up in bizarre situations each time, before trying to find out how he can fight back against this in the nine minute gaps that each of these jumps offer him. We are reminded of something akin to The Deaths of Ian Stone (2007) perhaps by way of a conceptual memory/identity bending science-fiction film like Total Recall (1990). The surprise that we get is a strong and intelligent science-fiction film with an ambitiously original reach – and moreover one that Clarke succeeds in pulling off within his modest-budgeted horizons. There is also an appealing array of nifty gadgetry in the background from the hologram computer screens to the DNA-locked guns. It is only in the minor name stars that The Anomaly did not end up with a better profile than the direct-to-dvd destination it received in most territories. 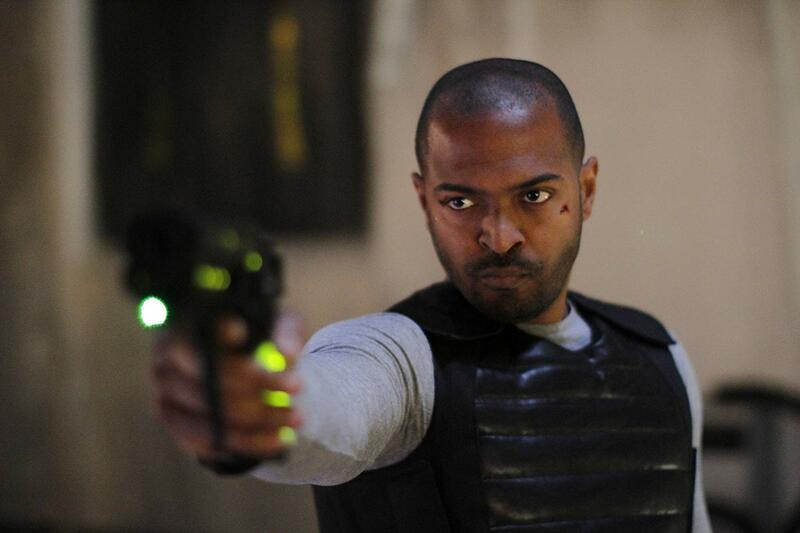 As director, Noel Clarke also feels the need to throw in a series of slow-motion action scenes. I was impressed by the fact that these are conducted in a way that hold a visceral punch. At the same time, you also are aware that this is not a film that needs to be pitched as an action film and could easily have done without action scenes at various intervals. The main problem here is that as an actor Noel Clarke comes off as just a regular guy. He never projects a larger-than-life handsomeness and physicality or a tight and controlled lethality. With his flak jacket on, he seems to fade into the crowd rather than dominate it. He just seems too non-assertive a personality for someone that you can mentally slot into being an action hero. Nevertheless, the story is interesting enough in its own right that you can ignore this and remain intrigued by the conceptual mystery that has been set up.